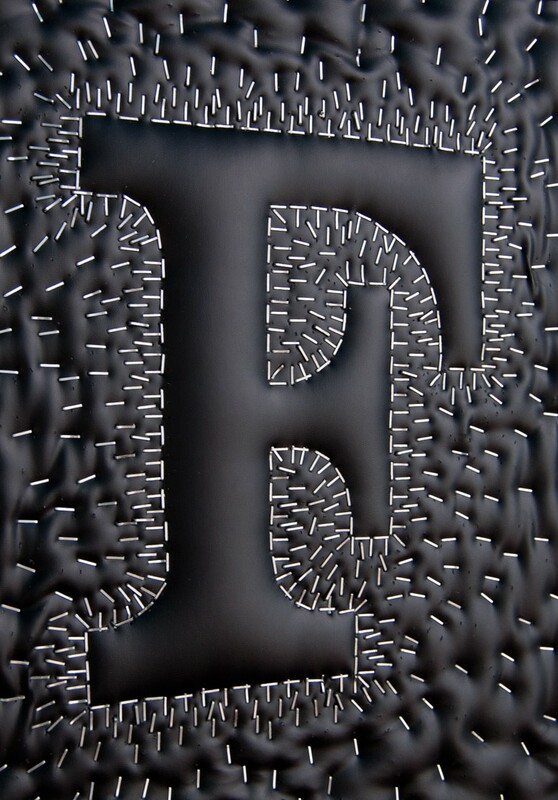 This F is a Clarendon (Monotype redo). Stapled into skai covered foam. Clarendon is considered to be the first registered typeface. It was designed in 1845 bij Robert Besley for the Fann Street Foundry. The patent expired after three years and it was copied, adapted and redesigned a lot. The typeface was used extensively in WWI and for Wanted posters in the wild west a.o. Are you thinking about having some bar wall art installed? Give me a call, custom handmade type is my thing, in all sorts of materials. Soft yet rugged, stylish and monkeyproof. Foam, skai and staples is the new padded bar wall art. Custom designs, give me a call.